1970 Bing Auga Board, Tom Warren and Steve Barger 4ft 10"
DESIGNERS: Tom Warren and Steve Barger. Foam blank, fibreglass and red resin gel coat, post production legrope plug (R). Bottom: Basically flat with deep concave/channel in the tail. Rocker: flat with nose lift. Image right : Tail concave #1. Bottom: A U G A - a black pin line letters down the board. Deck: .Red resin gel coat. Bottom: Red resin gel coat. Tail concave #2. Tail concave #3. Dimensions and board photographs by Vince Ray, Los angles, March 2012. Dear surf research, has anyone ever seen this type of rare surfboard? Do you know anything about it or have any stories?! It is an "AUGA BOARD" made at Bing Surfboards in Hermosa Beach California USA during the late 60's. 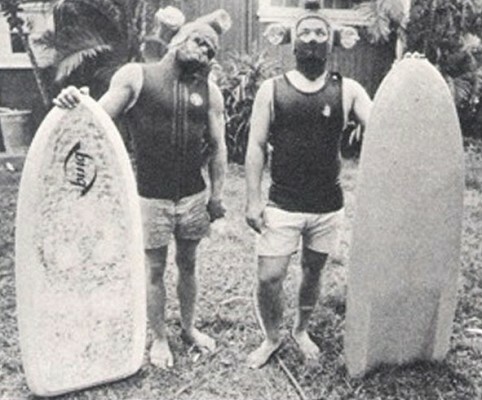 Tom Warren and Steve Barger (The Auga Men) rode these boards in the South Bay (Redondo Beach, Hermosa Beach, Manhattan Beach) doing 360's all over the waves. They then moved to Maui in the early 70's and tore the place apart on the Auga Board. They were in a movie doing many, many 360's at Lahaina Harbor by Steve Bingham?! Gerry Lopez was impressed with their Auga Board. The board is 4'10" long, 22" wide, 18" nose (12" up), 21" tail, 4" maximum thickness, rocker- nose 3", tail 1/2", Concave tail 13"
Surfboards late 60's logo on top. I showed the board to Bing Copland at his book signing in 2010 and he did not think there were any Auga boards with Bing logos that survived! Please contact me with stories or other information, thanks. 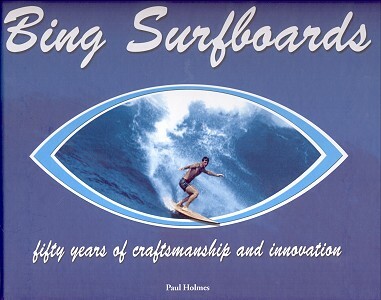 Holmes : Bing Surfboards (2008). contest officials: side slipping receeded dramatically. 20 s: Steve Barger or Tom Warren (goofyfoot) on a red finfless Bing Auga board, multiple 360s on left, at Trestles? 52 s: David Nuuhiwa, Twin fin Fish(es) ?, Huntington lefts? 2 m 02 s: Corky Carroll, dark red Hobie Twin fin, lefts, kneel paddles. Credits for the later on DVD include Steve Barger. Geoff Cater (1999 - 2012) : Bing Auga Board, 1970.